The Birchall boys face a long road trip into Europe this bank holiday, it”s the FIM World Championship and Team Mansfield travel to Germany. Fresh from their two week racing break, Ben and Tom are on their European travels once again as they return to the FIM fold. 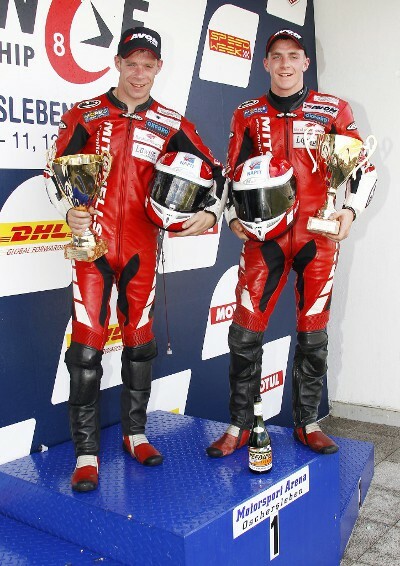 Having said that, Oschersleben, in the former East Germany is an unfamiliar hunting ground for team Mansfield as they’ve only raced there a handful of times in the past but Ben and Tom won’t let that stop their march toward another class win. Should the boys continue the form they’ve shown in previous outings it’s difficult to see them making anything other than a huge stride towards Championship glory. With a full 56 points between the flying Mansfield duo and their nearest rivals, it’s surely just a matter of time now before another Championship is in the bag. 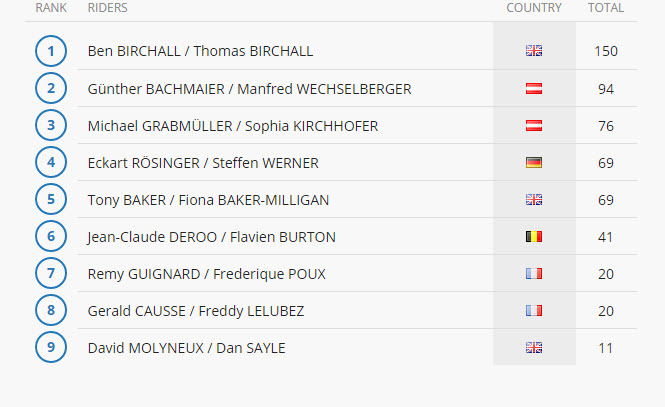 With the 4th place team of Rosinger/Werner racing on home soil, it’s going to be a tough ask for Backmeier and Wechselberger to pull back any points on Ben and Tom. 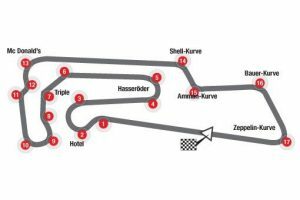 Motorsport Arena Oschersleben can be found on the eastern outskirts of the town of Oschersleben, around 20 miles southwest of Magdeburg in central Germany. The nearest international airports are at Leipzig/Halle (77 miles/124 kms to the south) or Hanover (88 miles/140 kms to the west). The circuit can be reached via the A2 Hanover-Berlin autobahn, exit Eilsleben or Wanzleben and follow the signs for the circuit, which is located around 25 kms from the motorway. Parking is available at the circuit for a small charge. You can also arrive by train. The nearest station is at Oschersleben, with connections to Magdeburge and the Berlin-Hannover ICE express train. The circuit is a short taxi ride from the circuit. It’s going to be a tricky weekend for the Birchalls and the rest of the teams in Germany. With temperatures forecast in the early to mid thirties Celsius, it’s not only going to be hard on the bikes but it’s going to be stiflingly hot for the competitors in race leathers and helmets. 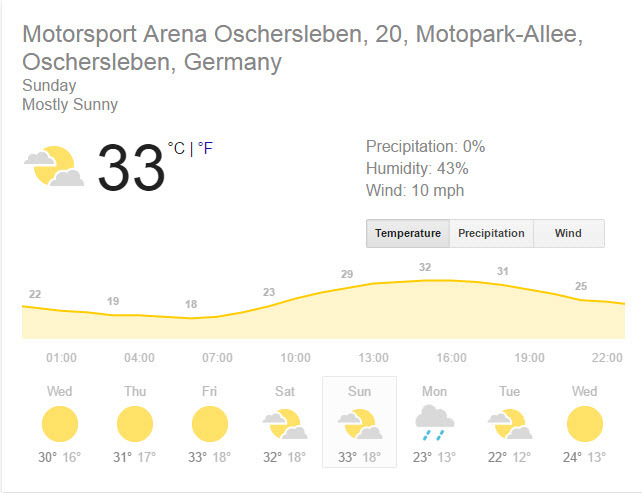 There’s very little chance of rain for this weekend and only a moderate breeze to cool the spectators so if you’re travelling to Germany to watch the boys, don’t forget your sun protection. 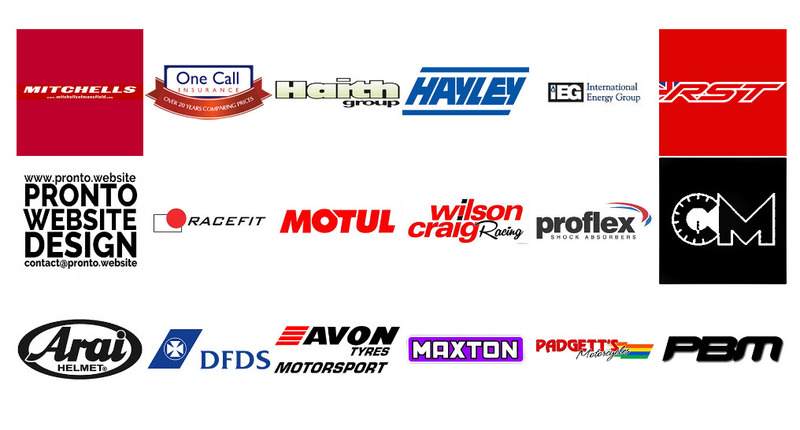 At this point we are rather light on information regarding live timing and that sort of thing, so please bare with us.